Luxury river cruise specialist Avalon Waterways will operate its first itineraries on the mighty Amazon next year, introducing an 11-day Peruvian adventure in its newly released 2014 brochure. The Amazon expedition is one of several new initiatives announced by Avalon as it celebrates its 10th anniversary, including new ships, new itineraries and new theme cruises. To mark the release of its new 2014 brochure, Avalon is offering earlybird savings of up to $1000* per couple on European cruises and $300* per couple on other cruises worldwide. 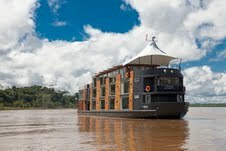 Joining Avalon's program in 2014 is the 45m Amazon explorer Aria, a contemporary 16-suite ship designed for cruising South America's greatest river in style. Exclusive to Avalon Waterways, it features floor-to-ceiling windows, an outdoor Jacuzzi, an exercise room, indoor and outdoor lounges, a bar, a boutique, an elegant dining room and an open-air sun deck. From February, the Aria will offer three-night cruises as part of an 11-day itinerary from Lima, priced from $6099* per person twin share (earlybird offer). Guests will venture deep into the Amazon jungle in search of wildlife including rare pink dolphins, as well as visiting indigenous communities and the remote Pacaya Samiria Reserve under the guidance of a local naturalist. Other highlights include the ancient Andean city of Cusco, the Sacred Valley of the Incas and the extraordinary mountain-top ruins of Machu Picchu. An optional two-day extension provides a chance to see the mysterious Nazca lines. Meanwhile in Europe, Avalon will expand its successful Suite Ship concept further with the introduction of three new vessels next year - Avalon Impression, Avalon Poetry II and Avalon Illumination. The newcomers will give Avalon a total of eight Suite Ships, making up more than half its European fleet of 13 luxury ships. Designed with Australian travellers in mind, each Suite Ship has two entire decks of all-suite accommodation and offers 30 per cent more cabin space than the average competitor. They feature wall-to-wall panoramic windows that slide back to turn the entire cabin into an open-air balcony, allowing passengers to enjoy the outdoors without compromising space. In addition to the new ships, Avalon will also expand its popular selection of themed cruises in 2014, introducing itineraries focused on beer tasting, golf, wellness and WWI history. The special departures join existing themes based on art, food, wine, history, music and Jewish heritage, allowing travellers to indulge their personal passions while sailing with other like-minded guests. In all, Avalon will offer 26 different European itineraries in 2014, sailing the Rhine, Moselle, Main, Danube, Seine, Saône and Rhône rivers. It will offer a further 12 itineraries worldwide, cruising the Nile, Yangtze, Mekong, Mississippi and Amazon rivers and among the Galápagos Islands. Save $1000* per couple on the inaugural sailings of Avalon's newest Suite Ships, Poetry II, Illumination and Impression. On sale to June 30, 2013 or until sold out. The eight-day Tulip Time Cruise aboard Avalon Poetry II departing Amsterdam on March 23, 2014, is now priced from $2552* per person twin share. Save $1000* per couple on select departures of more than a dozen different European itineraries. On sale to June 30, 2013, or until sold out. The eight-day Romantic Rhine cruise between Basel and Amsterdam is now priced from $1826* per person twin share. Save $500* per couple on all other European cruises. On sale to September 30, 2013, or until sold out. The 15-day Magnificent Europecruise between Amsterdam and Budapest is now priced from $4249* per person twin share. Save $300* per couple on any Nile, Yangtze, Mekong, Mississippi, Galápagos or Amazon cruise. On sale to September 30, 2013, or until sold out. The 11-night Inca Empire to the Peruvian Amazon is now priced from $6099* per person twin share. Further savings are available for early payments, additional tours and Journey's Club members. For full details and bookings see licensed travel agents, visit www.avalonwaterways.com.au or phone 1300 230 234. *Prices and special offers subject to availability and conditions.